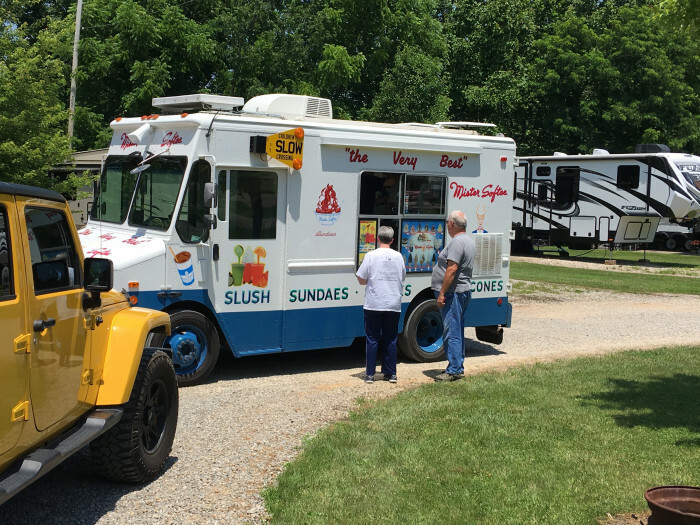 Ask fellow campers about "Carthage Gap RV Park LLC" and nearby attractions. Wonderful gem in the middle of the “Windy Nine”. Motorcycle routes, owners are very friendly and accommodating. Large lots and many friendly neighbors. We camped at Carthage Gap RV Park LLC in a Motorhome. Rode to Marietta and had a great lunch at Jeramia’s, lots of gluten free options and soups and salads. Looking forward to 3 more days of exploring. A little nervous driving our RV plus toad between the two lakes and up the hill, but guided back to a long gravel pull through with grass between sites. Very quiet and peaceful place. Lot of seasonal campers that only come on weekends. 16 miles to Athens, close to Go Mart and Dollar Store, Larry's Pizza is great and will deliver. Friendly owners who work hard to keep the place nice. Will definitely stay here again. We camped at Carthage Gap RV Park LLC in a Motorhome. Close to Athens, Ohio University. Not far from Marietta OH and Parkersburg WV. There is a great map for motorcycle trips in the office. Two lakes that you can swim or fish, see office for details. Stopped for an overnight. Site was level gravel. Very close to adjacent camper. This part of park is very nice. Would stay again if/when in area. 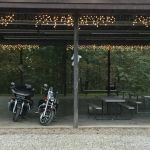 We camped at Carthage Gap RV Park LLC in a Motorhome. Was a little apprehensive when we pulled in due to the abundance of full time residents. We were escorted to another section which was a very large area with permanent unoccupied TT's and 5th wheels on the outer rim and 4 or 5 very large pull throughs for the transients. We were very pleased with the accomodations and hookups. We did loose power for about 30 mins but then it was restored. We would stay here again. 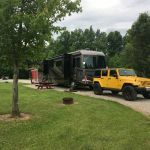 We camped at Carthage Gap RV Park LLC in a Motorhome. Very helpful, friendly host who took us to our site and leveled MH with planks. Even offered to help with hookups. Overnight sites were too close together - we were less than 4 foot from our rather large neighbor (big RV). Mostly seasonal sites but nobody there because...it was forecast to rain. GPS could not locate campground location, so do not rely on that. Just off 50E about 2 miles. 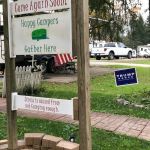 Quiet, well-cared-for campground with narrow roads. We camped at Carthage Gap RV Park LLC in a Motorhome. OK to stop for an overnight visit. Gracious host. Good location near Route 50. But what a neat campground, Lots of seasonal campers, but the owners have kept some very nice spaces available for us short term folks like us. Would surely stay here again the next time were in the area.. Very nice owners... We camped at Carthage Gap RV Park LLC in a Motorhome. As others have said, this is a really nice place. Kind of secluded in a great area. The owner obviously works very hard keeping the place looking good and everything working. It is mostly well-kept seasonals but there is an area for transients with 3 long gravel pull-throughs and some grass back-ins. We had a pull-through, and it was long enough to park anything on wheels. He wasn't putting anyone in the grass sites because it has rained a lot, and the ground was really soft. The gravel pads were fine. The transient area is open, so no problem with satellite reception (no shade to speak of either). Utilities were good, Verizon internet and cell worked well. The road into the CG is one lane, but it was not a problem. There wasn't that much activity on it, and the seasonals are used to it - they will get out of the way of an RV going in or out. We camped at Carthage Gap RV Park LLC in a Motorhome. Nice little country campground outside of Coolville. Has been here many years and is always full as it is about the only ticket in the area. 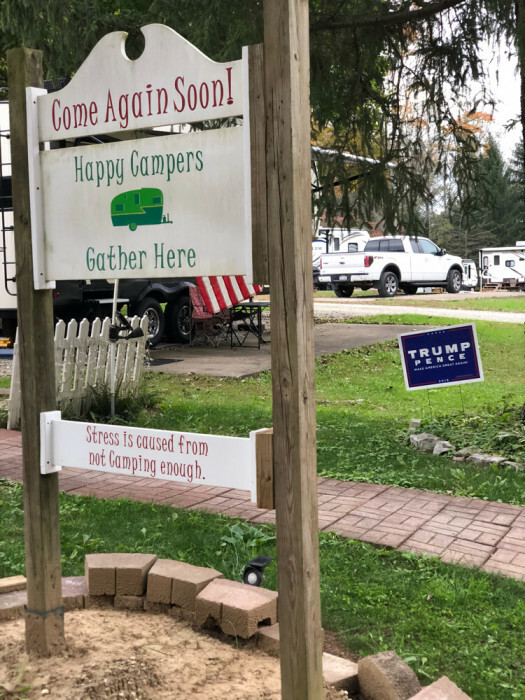 The owners do take pride in keeping the campground tidy and they do not seem to put up with any nonsense, which is a good thing these days. This is mostly seasonals, but they do have spots for transients, We are in a large field in the new section and we were escorted by the owner to the spot and had plenty of room for our forty footer. The road coming into the campground is a bit steep and gravel. It is also narrow, so keep that in mind and watch for someone coming down the hill and you will be fine. We had no problems. The hookups worked fine, no issues with surging. Would definitely stay here again if in the area. Enjoyed our stay, some of the seasonal folks we met were quite friendly. 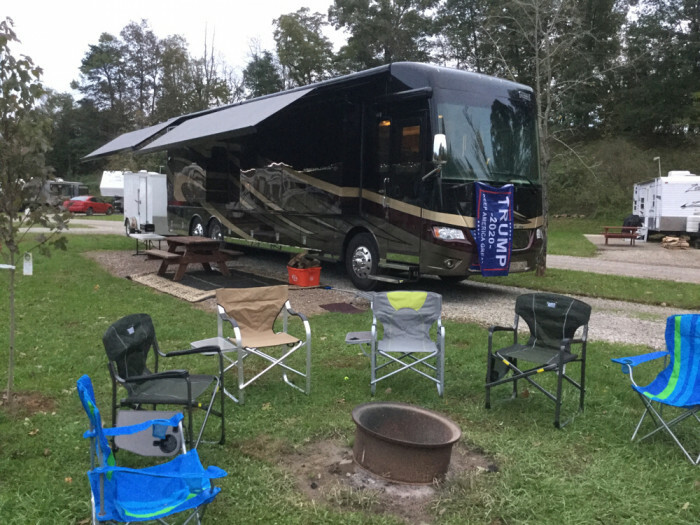 We camped at Carthage Gap RV Park LLC in a Fifth Wheel. Rate reflects a weekly rate. This is a nice spread out park located in the countryside. There are a fair number of long term residents, but we transients pretty much have our own area. The check-in process and site assistance could not have been more personalized or friendly. It is very quiet and the neighbors are warm and friendly to strangers. Would definitely stay here again. We camped at Carthage Gap RV Park LLC in a Motorhome. 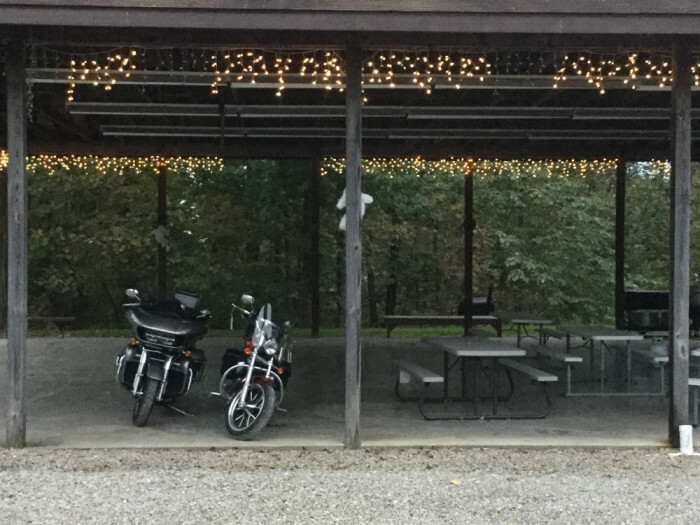 A large, full featured campground far enough from the highway to be secluded and quiet yet easily accessible, Carthage Gap is nestled in the middle of some great Southeast Ohio motorcycle roads (the reason for our visit). My ‘Big Rig’ is a 40 Motor Coach towing a 28’ trailer and Carthage Gap made it easy. Site was large, fairly level, had all the hook ups, fire ring, and picnic table. I had asked for a site that would allow my satellite receiver to work and they obliged. We called first and arrived after 10:00 PM. The owner waited for us and escorted us to our site. They were friendly and helpful and suggested a few really nice roads for my motorcycle. We planned on staying three nights and extended to four because it was that nice. We didn’t use the bathroom or showers so I can’t comment on them. The only negative comment I can make, and I’m really being picky here, is that the road in is only one lane. It never posed a problem, but I’d hate to think what happens if two big rigs, with TOADS met in opposite directions. I would not let that stop me from returning and do in fact plan to return. 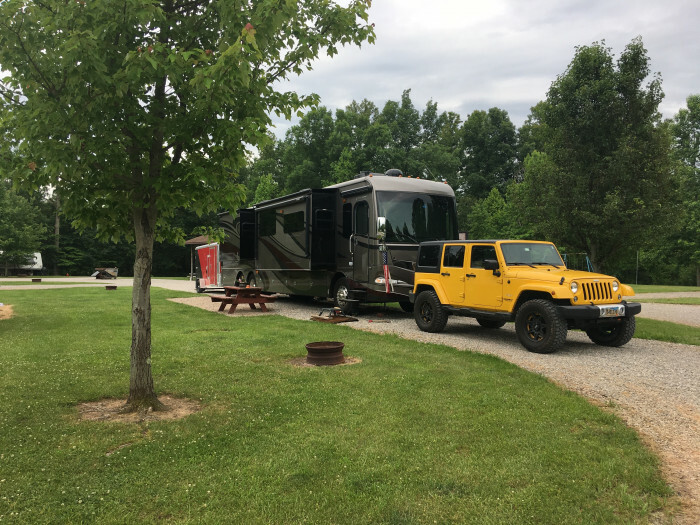 We camped at Carthage Gap RV Park LLC in a Motorhome. Very pleasant away from the traffic RV park. Family owned. The lady told us "don't worry about check out time, leave when you're ready'. Laid back attitude. Well kept grounds. Nice pavillion for a big gathering. We camped at Carthage Gap RV Park LLC in a Motorhome. This is a really great campground. Stayed in the newer section which was level and open for satellite reception. Owners are two of the nicest people anywhere. I deducted points as this park is a great place to stay however not much in the area to see or visit. We would definitely return again to visit here as it feels like coming home. We camped at Carthage Gap RV Park LLC in a Motorhome. Mostly seasonal rentals. The few transient spots were on grass which was soft after rain. Friendly proprietor. No heat in bathroom was adventurous. 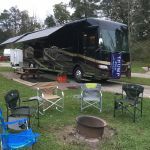 We camped at Carthage Gap RV Park LLC in a Motorhome. When entering or exiting road is one lane and very steep slopes to ponds on either side. One pull-thru that is shared. Staff is excellent and helpful. We camped at Carthage Gap RV Park LLC in a Motorhome. A great park. Great showers and restrooms. Wi-Fi is solid. Really friendly owners. Our second stay and will return when in that neck of the woods. We camped at Carthage Gap RV Park LLC in a Travel Trailer. 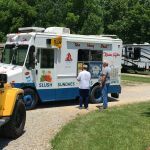 Are you affiliated with Carthage Gap RV Park LLC ?